It’s World Health Day again, falling as usual on World Health Organization’s birthday, on Thursday 7th April. Last year we wrote a blogpost about Food Poisoning for the food safety focus of 2015’s campaign. This year, however, the topic WHO are getting everyone to think and talk about is Diabetes. Type 2 diabetes is the largest growing concern across the globe, and this is particularly apparent in the US and UK. 1 in 11 adults have some form of diabetes worldwide, and what’s even more concerning is the rate at which children are starting to get type 2 diabetes, which is a condition brought upon largely through lifestyle choices, poor diet and obesity. In 1994, only 5% of young people diagnosed with diabetes had type 2 diabetes, with the rest suffering from type 1 diabetes which is not caused by a poor lifestyle. Today, however, that number has increased to around 40-50% depending on the area of the USA. In adults, type 2 diabetes is growing at such an alarming rate that some proffessionals are referring to it as an epidemic, estimating that 1 in 3 Americans will have the condition if nothing changes between now and 2050. All these statistics just go to show why WHO have chosen this rising issue as the focus for World Health Day. Nerve damage, particularly in the limbs. What can I do this Diabetes Day? The most important thing for us to stop the spread of diabetes worldwide is to educate people on not only the symptoms, as the quicker the condition is detected the easier it is to control and treat, but more importantly on the causes of type 2 diabetes. Type 1 diabetes is, at the moment, an autoimmune disease we don’t understand and cannot prevent, but type 2 is so closely linked to lifestyle and being overweight that some easy changes could help stop the onset of both the disease in an individual and the epidemic as a whole. The WHO have released their first ever diabetes report with 100s of statistics and pieces of information. Have a read of them and if you want to get even more involved, the aim is to get influential companies and governments to take this growing condition as more of a threat and put measures in place to stop it. Diabetes is not just a health concern, and WHO are emphasising this throughout the buildup to World Health Day. The condition is expensive to treat and with so many people developing the disease, some less privileged countries are already struggling to cope, and the bigger developed countries won’t be far behind. Because of this, some countries need our help and charity to be able to tackle the disease, as well as more fortunate countries around the globe needing to put a plan in action to help cope with the growing numbers and stop the incline. 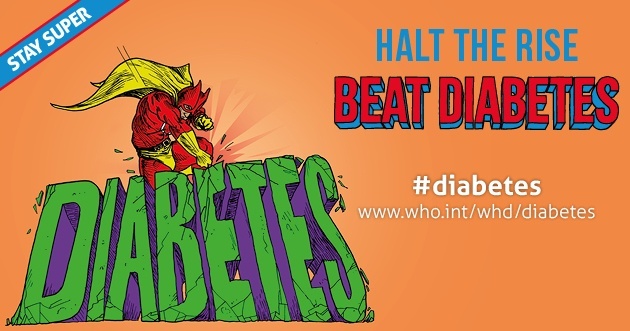 There is a lot more information on the WHO website on what you can do to help this World Health Day, but as always the most important thing is to educate and raise awareness on the causes, symptoms and available treatments of all diabetes.